The YA genre may have reached its zenith a few years ago, but a few stragglers still trickle out in hopes of capturing old glories. The Darkest Minds, which is based on the novels of Alexandra Bracken, is one of those, and its combination of teenage angst and rebellion will feel very familiar throughout. While those qualities certainly won't set the film apart, it's similarities to Marvel's mutant band of heroes the X-Men that are strong enough to possibly launch a brand new superhero franchise for the folks at 20th Century Fox, and clearly that's what they are counting on. Directed by Kung Fu Panda's Jennifer Yuh Nelson in her live-action debut, the film boasts a stellar cast of rising stars. The always-fierce Amandla Stenberg, who broke out with her role as Rue in The Hunger Games, emerges unscathed despite a script that can't help but be riddled with genre clichés. The world designed by Nelson and screenwriter Chad Hodge could've been ripped out of a Chris Claremont comic: After an unexplained disease wipes out 90% of the world's kids, those who remain possess strange and powerful abilities (mutants!!!!). The fearful government brutally rounds them up into camps and divides them into colors based on threat level. Blues and greens are largely enhanced intellectually and are harmless, but those colored orange or red are deadly and must be killed on sight. You can't have a dystopian YA thriller without a heavily militarized authoritarian government on standby. Stenberg plays Ruby, a young girl gifted, or cursed, with the powerful telepathic abilities that code her an Orange. When the emergence of her powers destroy any hope of staying with her parents, Ruby is forced into a camp where she hide her true abilities for years until a friendly therapist (Mandy Moore) working for a rebel faction known as The League helps her escape. From there it isn't long before Ruby stumbles upon a trio of like-minded youths with their own powers and a healthy mistrust of adults. Zu (Miya Cech) is the youngest and can harness electricity from her hands; Chubs (Skylan Brooks) is super-smart and super-nerdy, he's also super suspicious of Ruby; and Liam (Beach Rats breakout Harris Dickinson) is the Cyclops-esque leader who has powerful telekinetic gifts and no game for wooing the ladies. Naturally, his awkward attempts to impress Ruby will win her over, anyway. Together they hope to find a hidden utopia where others like them are said to be living in harmony, but if you guessed there were dangers there, too, then maybe your mutant power is recognizing genre tropes. There's no attempt to break the genre mold here; The Darkest Minds all but embraces its obvious influences, even referencing Harry Potter in one key encounter between Ruby and Liam. Will their tragic love story survive being chased by bounty hunters (Gwendoline Christie is sadly wasted as one) and tortured by a tyrannical government? Can they overcome fear over their own powers and learn to love? It's well-worn territory, but Nelson and her cast show a determined commitment to the material that is worth investing in. Tantalizing questions about the world-at-large are teased, with only a few answered and the rest dangled for future chapters. What does the rest of the world look like? Are all of the parents of these kids down with what's going on? Why have the country's banking and social institutions collapsed on itself when all of the adults are still alive to run things? The most demanding questions aren't really fit for the target demo, but the film still has its share of disturbing moments, most of which involve kids being gunned down in cold blood. For all of the violence that does break out, the most twisted act is by Ruby herself, committed out of anger against a bounty hunter who had been on their trail. Nelson is still finding her footing behind the camera, especially when it comes to the generic action sequences, but she knows enough to lean heavy on her stars to deliver emotionally. Stenberg continues to impress, whether she's leading her fellow charges into battle or falling head over heels. The romantic chemistry between her and the impressive Dickinson is debatable, though. Maybe they should just be friends? As a couple they share a couple of sweet but fleeting moments, which is about what you'd expect for the first part of a potential trilogy. 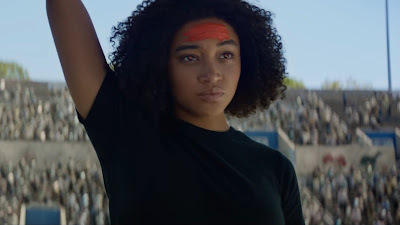 While the open-ended conclusion promises Ruby's eventual evolution into the Mockingjay or something, it remains to be seen whether The Darkest Minds will ever reach that point.